Ideal for use in harsh weather and high wind conditions. Duck Covers Ultimate Series fire pit covers are designed to protect fire pits from dust, dirt, sun, rain and heavy snow. Manufactured using a combination of high-strength polyester top panel, plus innovative, multi-layer, breathable side panels to help eliminate condensation. The multi-layer, breathable side panels eliminates the need for vents and provides additional cover height. High-strength polyester base for added durability. Mocha Cappuccino color. Two-year limited warranty has you covered. 100% Waterproof - Ideal for high moisture climates. 2 inch wide hook and loop straps to secure cover in place. Color coordinated so patio furniture covers can be combined with Duck Covers Elite or Essential Series. Fits most fire pits up to 36 inch diameter. The Hickory Square Fire Pit Cover from Classic Accessories is made from durable Weather10 material featuring a rugged fabric outer layer with a laminated waterproof and wipe-clean inside coating. Weather Leather trim looks authentic but wont rot. Fits round fire pits up to 40-inch wide. 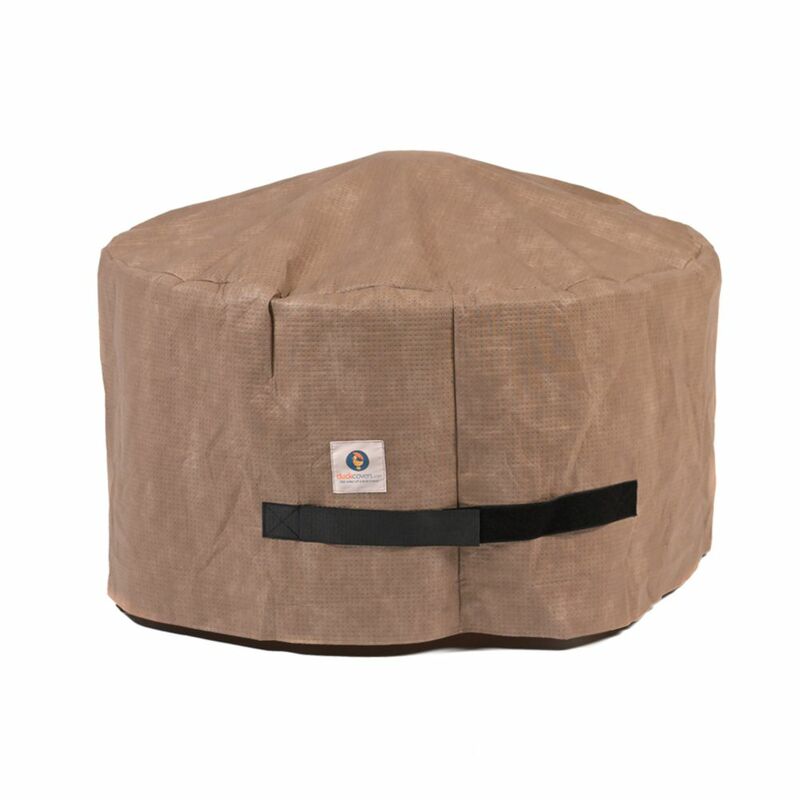 The Hickory Round Fire Pit Cover from Classic Accessories is made from durable Weather10 material featuring a rugged fabric outer layer with a laminated waterproof and wipe-clean inside coating. Weather Leather trim looks authentic but wont rot. Fits round fire pits up to 60-inch diameter. Two Dogs Designs patio covers offer excellent quality protection for your outdoor patio and barbecue needs at great prices. These durable covers come in khaki or black and are made of heavyweight polyester with double stitching, thick PVC lining, and Velcro tabs/ties to help you protect your investment. The covers are offered for regular and oversized furniture, grills and smokers, fire pits, patio heaters, fountains and log racks to help you create a unified look for your outdoor living area. Round Fire Pit Cover, 50-inches Ideal for use in harsh weather and high wind conditions. Duck Covers Ultimate Series fire pit covers are designed to protect fire pits from dust, dirt, sun, rain and heavy snow. Manufactured using a combination of high-strength polyester top panel, plus innovative, multi-layer, breathable side panels to help eliminate condensation. The multi-layer, breathable side panels eliminates the need for vents and provides additional cover height. High-strength polyester base for added durability. Mocha Cappuccino color. Two-year limited warranty has you covered. Round Fire Pit Cover, 50-inches is rated 4.5 out of 5 by 20. Rated 5 out of 5 by walnut3518 from This grill/firepit cover is the perfect size for our grill/firepit. The fabric is flexible and wa... This grill/firepit cover is the perfect size for our grill/firepit. The fabric is flexible and waterproof, and keeps everything dry inside. Rated 3 out of 5 by MRK from I Purchased this cover for our fire pit not... I Purchased this cover for our fire pit not realizing that my measurements were way off. The cover is too large but I will make the necessary adjustments myself with my sewing machine. It’s not worth it to me to send the item back. I hope the fabric holds up better than the original cover. Rated 5 out of 5 by Mike from It covered the fire pit completely.... It covered the fire pit completely. Rated 3 out of 5 by Max from The cover is good quality. The cover would be better if it had two more velcro straps to ensure t... The cover is good quality. The cover would be better if it had two more velcro straps to ensure the wind does not blow the cover off.